The geometrically inclined Arabesque pattern, part of our extensive cement tile collection, pays homage to the rich look of classic clay bisque tiles that have been used throughout Spain, the Mediterranean, and northern Africa for centuries. Arabesque Spanish Cement Tile. Aragon pattern in Cotto Dark shown. Dec. 10, 2012 - PRLog -- Our newest line of cement tile offers not only a classic, time-tested look, but also the durability and craftsmanship of traditional handmade cement tile. Introducing Arabesque Spanish Cement Tile! The geometrically inclined Arabesque pattern, part of our extensive cement tile collection, pays homage to the rich look of classic clay bisque tiles that have been used throughout Spain, the Mediterranean, and northern Africa for centuries. With Arabesque, you’ll also receive the durable, time-tested benefits of cement tile with the advantage of a broader color palette, sizes, and shapes that are adaptable to any décor and environment. Further, by using our Arabesque Spanish Cement Tile in your next design project, you'll feel good knowing your choice is also benefits the environment. Manufactured in the USA, this collection is made using a high percentage of locally sourced materials, which minimizes transportation impact. Moreover, the cement used for producing these tiles is supplied by an Energy Star Certified factory. Our Arabesque Spanish Cement Tile come in various square and rectangular formats. All tiles are 3/4"-thick nominal thickness. You'll find square formats from 2"x2" to 16"x16"; and rectangular formats from 2"x4" to 8"x16". Finally, unlike Spanish pavers, these tiles are available in 30 colors and two blends. The colors are available in two styles: solid or flash. The Rustic Spanish Paver color palette includes classic bisque colors in terracotta, red and brown that provides traditional style. The Classic style takes its cue from clay bisque that would be historically used to make Saltillo tile, brown Spanish pavers, and red clay tiles. For a more contemporary look, choose from our extensive collection of 24 colors within the Premium color palette, which includes subtle greys, green, plum, rust and tan. 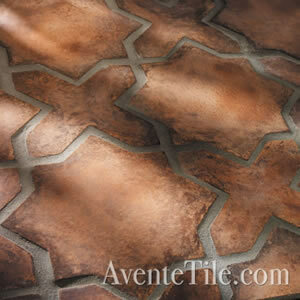 For information about Avente Tile and the cement tile products we offer, visit http://www.aventetile.com. Or, simply contact Bill Buyok at bill@AventeTile.com. At Avente Tile, our passion is hand-painted ceramic tiles and cement tiles. We work exclusively with small artisan factories, craftsmen and artists to develop unique tile lines. Our ceramic collection includes hand painted field tile and decorative tiles including classic Spanish and Portuguese tiles, relief tiles, plant and animal themed tiles, murals and mosaics. We offer cement tile in contemporary and traditional patterns in standard or custom colorways. Visit http://www.aventetile.com to view our complete inventory of cement and ceramic tile offerings, inspirational Cement and Ceramic Tile Design Ideas portfolio, and technical/installation data. Need help, or have questions? Then contact us via email at info@aventetile.com, or call (888) 739.4972.